Where to hike in Steamboat. The Rocky Mountains offer unbelievable scenery in the summertime. The high peaks and lush valleys are filled with cascading creeks, alpine lakes, wildflowers, and wildlife, making hiking one of the most enjoyable activities. The trails in Steamboat Springs couldn’t be more accessible, offering a variety suited for every ability and age. Whether you’re enjoying a relaxing weekend with your family or searching for the most stunning vistas and landscapes, your trail is waiting to be discovered. Here are a few of our favorite hikes in the area that are sure to please everyone in the group! One of the most recognizable waterfalls in the state, Fish Creek Falls is enjoyable for all ages (including wheel-chair access). From downtown, take Fish Creek Falls Rd. 3.5 miles to the trailhead where you will find a couple different options for instant viewing. Located ¼ mile from the trailhead, take the paved path to the stunning overlook of the 283 ft. falls. If your desire is a hands on experience, head down the trail ¼ mile to the bridge at the base of the falls where the waters roar will stop you in your tracks. If you are searching for a few extra miles, continue on the trail for another 2.5 miles climbing 1,600 vertical feet to the second falls (at 40ft, the second falls is much smaller but also breathtaking). Looking for a beautiful overlook of the town? Look no further than the Quarry Overlook on Emerald Mountain. Although there are many combinations of trails that will take you to the overlook, the most convenient access is the Blackmere Trailhead. Heading west through downtown Steamboat, take a left on 13th Street, take your next left on Gilpin Street followed by a left onto Fairview Drive which will lead you to the trailhead. 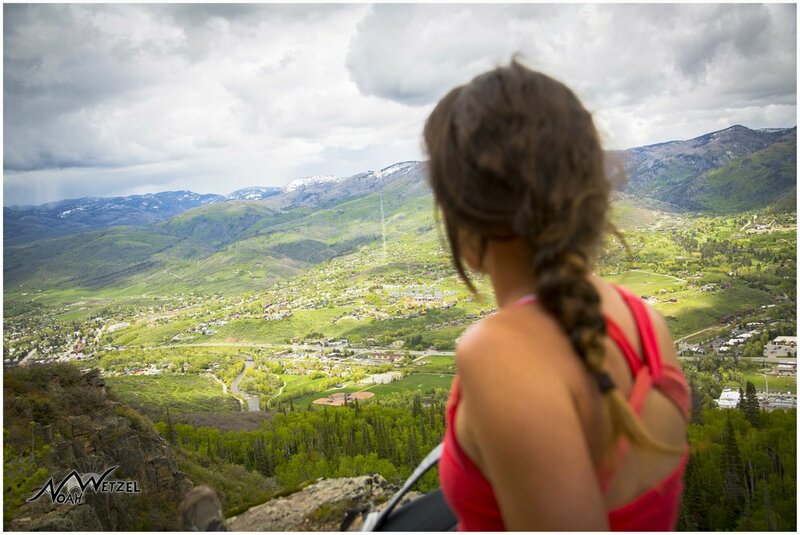 Begin hiking on Blackmere Drive, climbing 1,000 vertical feet and 1.75 miles until the road comes to an end, giving way to the stunning overlook of Steamboat Springs. Witness the contours of the entire valley – from Rabbit Ears Pass to Downtown Steamboat – carved by the beautiful Yampa River some 1,200ft below! Keasha Speidel and her daughters Nevaeh and Tinley cool off near the Mad Creek Barn. This is a perfect hike if you’re short on time or have a few youngsters by your side or on your shoulders. The Mad Creek Trail offers soothing views of the Flat Tops as it climbs up the gentle canyon overlooking Mad Creek. Hiking for approximately 2 miles and 1000 vertical feet will lead you to the 110-year-old barn on a homestead that James (Harry) Ratliff (a notable member of the National Forest Service) built after purchasing the land in 1904. This hike is most popular in the spring and fall – positioned on the south facing slopes. However, if you find yourself hiking in the summer months, escape the heat and continue walking on the trail another ¼ mile where you will reach a small bridge and a shaded sandy beach that’s perfect for cooling off and enjoying lunch. Mount Werner has a wide variety of hiking to offer, and with access to the Gondola, it’s one of the easiest ways to take-in the unforgettable vistas of the Yampa Valley with very little effort. Hop on the Gondola, located at the base of Steamboat Resort where you will be whisked up to 9,080ft. Your legs will be fresh, and choosing a scenic trail that will guide you to the top of Mt. Werner is guaranteed, offering breathtaking views at 10,568ft. Rabbit Ears Peak is positioned on the continental divide and one of Steamboats most iconic landmarks – resembling the Ears of a Rabbit. This hike is the best in mid-July, where you will be welcomed with an exquisite display of wildflowers. Only 6 miles’ round trip and 1,000 vertical feet of elevation gain will reward you with a spacious 100-mile radius panorama. Take Hwy 40 East to the Dumont Lake Campground turn off. Follow the road past the campground and picnic area, turn left at Rabbit Ears Pass monument and follow signs to NFSR 291 on right. Park and hike on the road which bears to the right. Another Steamboat classic, this hike is located in the Flat Tops Wilderness, offering unrivalled views of central Colorado and the surrounding mountain ranges – holding a stiff reputation for adventure. The Devils Causeway describes a narrow strip of land (roughly 100ft long) that connects two mesas above 11,800ft, stopping some dead in their tracks at its most-narrow point of 4ft. Head south of Steamboat on highway 131 for approximately 30 minutes before hitting the quaint town of Yampa. From Yampa follow CR 7 for roughly 7 miles and then continue straight on Forest Service Road 900 to the trailhead at the end of the road. Hop on trail 1119 where you are immediately welcomed with a beautiful view of Stillwater Reservoir above 10,000ft. Roughly ¾ mile from the trailhead you will reach a junction, take a right and continue on 1119 passing above Little Causeway Lake until you are above the tree-line. At this point there’s only another mile to hike until reaching the causeway, however the hiking increases in difficulty as you approach the ridgeline saddle where you will reach another sign, proceed left and make the final 300ft steep ascent. If you are comfortable and confident, crossing the Causeway won’t be an issue, but it will certainly make you think twice! Gilpin Lake is the most iconic hiking destination in the Steamboat area. Tucked into a high pocket in the Mount Zirkel Wilderness, Gilpin Lake is sure to take your breath away, no matter how many times you’ve witnessed its beauty. At 10,338ft, the deep blue water is encompassed by dramatic peaks rising over 12,000ft, fields of wildflowers, and endless creeks and streams. Head west of downtown on highway 40 and take a right onto CR 129, passing through Clark and taking a right on Seedhouse Road. After a few miles the road will quickly turn to dirt, eventually leading you to the Slavonia Trailhead. The drive is roughly an hour, and the hike to Gilpin is a manageable 4 miles. 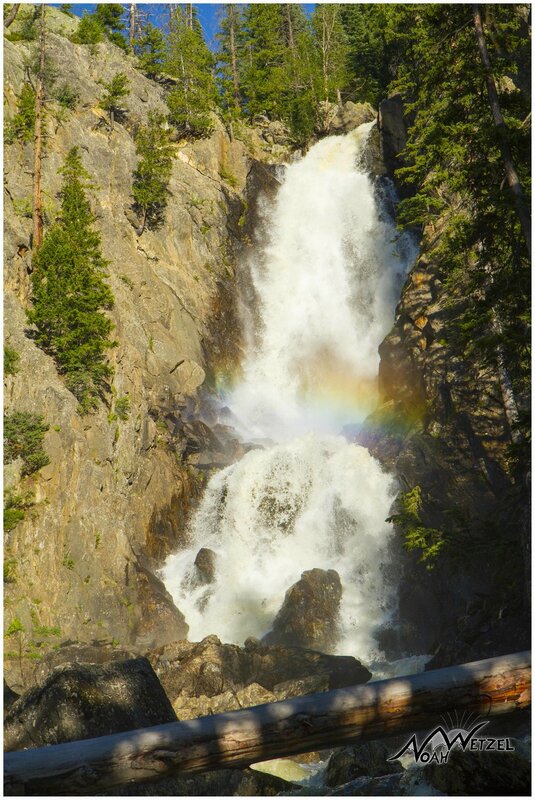 If you are looking for a few more miles, continue past Gilpin Lake and over the pass where you will link up with the Gold Creek Trail passing Gold Creek Lake and make your hike a 10-mile loop. Simply put, the Mount Zirkel Wilderness is sheer beauty defined, you will be surprised this area exists and is easily accessible from Steamboat!